It CANNOT be the same as any NetID password you have used in the past. It should not be similar to the old password. It should not be the same as or similar to any passwords you use for other purposes, such as online banking or shopping. It should be easy for you to remember and difficult for other people to guess. Follow the guidelines at Strong Passwords for Your Computer, NetID, and Other Cornell Services. When you follow the steps below to change your password, you will see the exact requirements for password length, complexity, etc. At the Manage Your NetID page, click Change your Password. 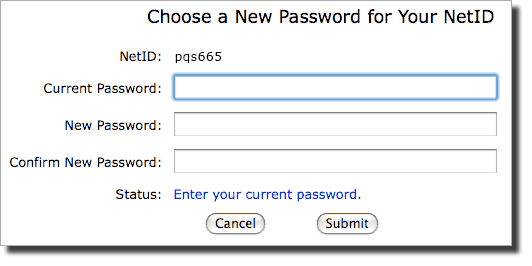 On the Choose a New Password for Your NetID page, type your Current Password, then type your New Password twice. Below this dialog is a summary of the password rules, with links for further help and information. Click Submit. A message will tell you whether your password change was successful. If not, the message will explain what's wrong and you can retry changing your password. To change your security questions, go to netid.cornell.edu and click Set your Security Questions. If you have not previously set your security questions, do so now. Setting your security questions will allow you to set a new password without visiting the IT Service Desk, should you ever forget your password, or if you suspect it's stolen. Unable to change your password? Visit I Have a Problem with My Password. What Should I Do?